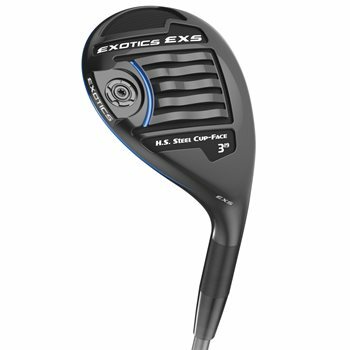 The Exotics EXS Hybrid features a Flight Tuning System (FTS) that includes an interchangeable sole weight. As well as a Cup Face Technology with a Variable Face Thickness (VFT Technology) for an expanded sweet spot. Also includes a new and improved SlipStream Sole for a faster clubhead speed throughout the turf. FTS™ (Flight Tuning System) adjustable sole weight brings back CG and could adjust to change swing weight and launch characteristics. HT 980 Steel Cup Face quench-hardened high-density steel made thinner yet stronger with special heating technique.